If you’re suffering from self-loathing and a loud inner critic, you’re in the worst kind of prison. You can’t evict your inner voice, so if it’s harsh, shaming and unforgiving, there’s nowhere to run. If you’d categorize the way you’re speaking to yourself as abusive, were you to hear the same words coming from someone else’s mouth, then it’s time to stage a take-down. Because that’s no way to live. Where Does Your Inner Critic Come From? Sometimes we absorb the way we were spoken to growing up. Not everyone is received with love, not everyone is nurtured. Peggy O’Mara has a quote, “The way we talk to our children becomes their inner voice.” I think there’s a lot of truth to that, but it isn’t the whole truth. You may have come from an incredibly loving home, but suffered unkindness at school. Scared and confused children can be mean, as can those who feel powerless at home. Events may have occurred that made you doubt yourself, or question your ideas about your own worth. Sometimes we’re going along just fine, and then we’re completely derailed by a romantic relationship, or an interaction with someone who has power over us, and it’s a game-changer. Other times, we learn and we grow and we look back and feel intense shame for certain choices we made, or ways we let ourselves or others down. 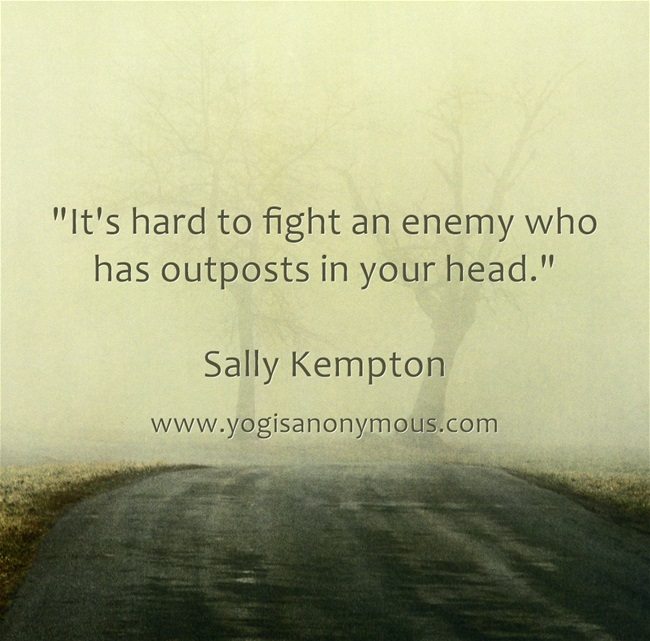 There are all kinds of reasons that voice in our head can become critical and unrelenting. Coming out of abuse is another one. Feeling like love is conditional and can be withdrawn at any time will also do it, because any time you fail to meet your own unrealistic expectations of perfection, you’ve set yourself up for the punishing sting of pain and disappointment. There are all kinds of ways we can betray our own tender hearts. The thing is, in order to shine and to share, you have to have some belief in yourself. And to be straight with you, not believing in yourself is the worst kind of hubris. It’s not a level playing field, but we’ve all been given the gift of a body, some time here on earth, and the ability to love deeply. Squandering those gifts is the equivalent of hijacking your experience here. You can look back and rant and rave and point fingers. You can write a dissertation about why you are the way you are, and why it isn’t your fault, but time will keep on ticking. And you can’t have it back. We all make mistakes. We’ve all suffered loss to some degree or another, along with heartache, grief, regret, fear, confusion, shame, doubt and longing. If we’re lucky, we’ve also tasted joy and gratitude, love, kindness and connection. It’s a mixed bag here on planet earth, but it’s a wildly interesting ride. Getting bogged down in rage is no way to travel. There are so many tools available, so many paths of liberation, so many ways to enjoy the gifts we’ve been given. You really don’t want to rob yourself of all the beauty available here. How Do You Starve Your Inner Critic & Feed a Loving Voice? How do you starve an inner critic and feed a loving voice? I’m sure there are many tools, but the ones I’ve tested personally are the physical yoga practice, and seated meditation. There’s a saying, “How you do anything is how you do everything”, and I believe that to be the truth. If you’re critical of yourself out in the world, the same will hold true when you’re on your yoga mat. But if you stick with it and make it about breathing deeply and consciously, and not about how you look or what’s happening around you, a miraculous thing will happen. You’ll start to take the road marked “Inward”, so you can take a look around and start dealing with anything that isn’t serving you. You can start to observe yourself from the inside out, and build the muscle called compassion. You can work on the quality of patience. You can calm your nervous system with your breath. You can create enough space between your thoughts to get a taste of something called peace. And you can develop the ability to witness your tendencies, your thoughts and your feelings. You can start to recognize that you don’t have to believe everything you think, as the saying goes. You can start to choose better thoughts. Over time, you can feed a loving voice so it grows and strengthens and takes over your life. It just takes work and determination. Feel free to reach out if you need a little nudge. If it were possible to have irrefutable answers to life’s big questions, I’m pretty sure we’d have them by now. We arrive in this world, and we’re received with love, or we aren’t. We don’t have to worry about a roof over our heads, or we do. We’re afforded an excellent education, or we aren’t. We have a stable home life, or we live in a war zone. We grow up being told what to think, or we’re allowed to make our own way. The possibilities are endless, but we do have some things in common. We deal with the same parameters, that’s one thing. We’re on this pale blue dot of a planet, and we don’t know how long we get to be here, or how long our loved ones get to be here, either. We don’t know for sure what happens after this. No one tells us the best use of our time and energy, or maybe lots of people do, but we all have to make sense of that on our own. We will all suffer to some degree or another, because this life, even if you have all the advantages in the world, is not an easy gig. It’s wildly interesting, and there’s always the potential for deep love, but along with that comes the potential for knifing loss, and that is not easy to face. We are inherently vulnerable. Some of us will experience the kind of loss that makes us question the point of it all. But we have this incredible capacity to love, and a great desire to heal our old wounds. We might not have a lot of the answers, but most people who’ve been on the planet for awhile seem to agree that love and connection are the best experiences available to us. I mean, you know you have now. So what are you doing with your now? The greatest shortcut to happiness is to do whatever you can to uplift those around you. Giving feels good. Being seen and understood, cherished and celebrated not in spite of, but because of, all our flaws and all our beauty is a great gift, and it’s beautiful to give that to other people, too. Listening deeply, caring with your whole being, these things feel amazing and they’re available, every day. You can get caught up in your plans and ideas, you can join in the race, but I really think the better focus is the moments. How can you love with your whole heart, today? If you’re brave enough to get quiet, to sit up tall for a few minutes, and to feel yourself breathing in and breathing out, you will feel a connection to everyone and everything. That simple act will bring you right into the now, and now is where you need to be if you want to feel love, joy, gratitude and peace. You can’t be in yesterday or tomorrow, you have to be in this moment. Being present feels good. You don’t need to buy anything in order to experience that calm, that steadiness. If you want answers, they don’t reside in a place or in another person. The answers you need are always inside, and those are the only answers you’re going to get. Ultimately, you have to make sense out of this world yourself. If you take the time to create peace within you, you’ll experience it around you, and you’ll be spreading it wherever you go. We have tremendous power to affect the way our lives feel. Of course there are devastating things that can happen to any of us, but it’s how we face what we’re given. We experience our life as if it has a beginning, middle and end. We treat this like it’s our personal story, but that isn’t it. We’re joining a much larger story. We’re in the flow, and then we’re out of it. The flow goes on without us, although what we contribute while we’re here certainly affects it, and those ripples continue on. But it’s not your story, or mine. There are currently about seven billion of us contributing to this dance. What kind of dance are you doing while you’re here? Being present means we’re opening to things as they are and trying to come back with love. We can focus on everything we don’t have, or we can direct our attention to those gifts we do have. Part of quieting the storm that rages in the mind involves choosing the thoughts that will strengthen us. Yes, there are things that can make us sick from the outside, but a lot of the time it’s our own thinking that’s causing us to suffer. We can argue about all kinds of things, but it’s pointless. We’re all in this mystery together. We can get caught up in names, borders, colors, religions and opinions, but love is the best answer you’re going to get. Recently, a close friend of mine was left suddenly and without explanation by her husband of less than a year. They were having the normal struggles of any newly married couple, exacerbated by the fact that neither of them had lived with romantic partners before. Just the normal communication issues, and the push-pull we all go through when we’re shifting our perspective from “I” to “we”. They’d talked about going to counseling, and about making some other changes, too. He’d expressed a desire to move to another part of the country, and she’d been open to that. Throughout the relationship, right up until the day he took off, their text messages were loving, flirtatious and affectionate, their time together was mostly fun, and she had no reason to imagine he’d bail. One morning he got up, kissed her goodbye as they left the house to go to their respective jobs, and that was the last time she saw him. When he didn’t show up for dinner, she texted, and he said he was out with friends and that he’d probably crash with one of his buddies. She asked him where he was, but he just said he was out having fun, and he’d see her in the morning. And then he didn’t show up in the morning, and she called and got his voicemail. When she texted, he said he’d be home later in the day, and that he was running errands. It turned out he’d gotten on a plane and flown across the country. She found out from his friend’s wife, when she called to see if he knew what was going on. She flew across the country to see him and sit down face-to-face, but he refused, and his family told her to go away. He wouldn’t even respond to her texts, his mother texted to let her know he did not want to see her. She’d spent three years with him, she’d spent plenty of time with his parents and siblings, and not one of them would meet her for a tea, or even get on the phone. Her family and all her close friends, myself included, told her to come home. When there’s no communication, there’s also no hope. And when his family also shunned her, we all understood this was their modus operandi. Two weeks later, he served her with divorce papers, citing irreconcilable differences. Then he proceeded to make demands about all the wedding gifts and furniture he wanted. She told me when she saw the list he sent with the movers, the nine-page list of things he wanted them to collect, it finally sank in. He cared about kitchen knives, but not her heart. He wanted the garbage can, but he didn’t want to know if she was okay, or how she was coping. He just didn’t care. And so she was left in the dark, trying to figure out what had happened. Was the whole thing a sham? Had he ever loved her? Was the huge wedding he’d wanted just for show? Had he meant anything he’d said on their wedding day, or any day? She told me she felt like she was in the “Twilight Zone”, and that at any moment, Rod Serling would step out from behind a closet door, or from around a corner, and tell her she’d entered another dimension. Life is like this sometimes. We’re going along, and BAM! A bomb goes off in the middle of our lives, and everything we thought we knew is just blown to pieces. Sometimes it happens because we’re abandoned, like my friend, and sometimes we lose people because they’re ripped from us too soon. Sometimes circumstances create the boom. Maybe we’re fired, or our house burns down, or we’re facing some other huge turn of events we could never have seen coming. We’d never wish that on ourselves or anyone else, but it happens. And once you feel all the feelings around the experience—the shock, the grief, the confusion, the rage—you have a chance to begin again. Some things are so brutal, you have to accept you’re never going to be the same. Some things will never make sense, some things will never be explained, some things will rip your heart out of your chest and eat it with a fine chianti. So be it. The question is, what are you going to grow out of those ashes? People and circumstances can hurt you, but they can’t defeat you unless you let them. You can’t rush through your feelings when you’re in turmoil; in fact, I’d say that’s the moment to use every bit of the support system you have in place, or to get busy creating one. That’s when you figure out who in your life is really going to be there for you. And that’s really good information to have, because then you know where to invest your time and energy, and with whom. All you can ever do, is start where you are. We learn and grow from every experience, but we have to choose the lesson. My friend doesn’t want anyone to speak badly of her ex, and she isn’t fighting him for stuff or money. As she said to me, “The more he takes, the less he has.” How’s that for choosing the lesson? In yoga practice, so much of what we’re doing is about stripping away. It’s very possible, and quite common, to reach adulthood and have no clue who we are or what we need to be at peace. Culturally we’re taught to look outward for happiness; if we just meet certain “markers”, if we can look right and have the right job and the right partner and the right house and car, then we’ll be good to go. A lot of people are so focused on attaining these outer signs of happiness, they pass right by the signs that would actually lead them there. Also, there’s the way you grew up. Maybe you were taught, in word or through actions, that your worth as a human being was based on your performance; if you did well in school, if you were a good boy or girl, then all would be well. If you screwed up or failed to reach the bar, love was withdrawn and the disapproval was palpable. Maybe punishment was swift and intense. That’s just one example, of course. There are many. Maybe you grew up in a house where you felt unsafe, and you learned to be indispensable or invisible depending on the moment. Maybe you were spoiled rotten and taught that you were the center of everything, and that other people existed in order to orbit around your needs and wants. Perhaps you were taught that your needs and wants were something you were supposed to swallow, and that your fears and dreams had very little impact on the world around you. Maybe you were parentified and got a huge lesson in care-taking and people-pleasing. It’s a huge spectrum, but the chances for knowing yourself are slim in any of these scenarios. This is why we have so many people who reach adulthood and have no idea which way to turn. The house doesn’t do it, the diet doesn’t do it, the right partner doesn’t do it. What’s the point? Where have they gone wrong, why isn’t the formula working? The formula doesn’t work because it’s based on the stuff around us, not the stuff within us. I know someone who’s been searching for the “perfect house” for years. Money isn’t an issue, the location could be anywhere. No matter where he goes or what kind of house he buys, it’s never the right one. It never does the trick. If you want to be at peace, you have to get your true house in order. Your body is your home. If things are not well within you, they won’t be well around you, even if you buy a mansion in Bali and have people on hand to feed you fresh mango at your every whim. There’s no escaping yourself. In the yoga practice, we’re looking for “vidya” or “clear-seeing”; being able to identify what is real from what is unreal, what is permanent from what is impermanent. You have to question everything you think you know, because you may have accepted things along the way, decades ago, that turn out not to be true for you. You may have adopted ways of being that don’t serve you, that dis-empower you, or block you from receiving love and joy. You may have a lot of unlearning to do. Maybe you’ve come to believe you aren’t lovable, or that you’re broken in some un-fixable way. Maybe you think you can’t trust anyone, or everyone lies and cheats. There are all kinds of ideas you might have developed that just aren’t true, and so you have to dig. You have to unearth. You have to do the work to heal your deepest wounds so they don’t direct your entire life. The way to peace is inside, not outside, and the sooner you start, the faster you get to a place where life feels good. Avoiding this work is the surest way to suffer. You aren’t here to suffer, although it’s part of life sometimes. You’re here to shine. I wouldn’t wait. It’s always good to learn from our experiences. This is how we grow and open, it’s how we develop character and begin to know ourselves. There’s a lesson in everything, but not everything is a lesson, and I think that’s an important distinction to make if you want to be at peace. I’m a yoga teacher, and I’ve been teaching for quite a long time, and I know a lot of yoga teachers. So my newsfeed is filled with inspirational quotes on a pretty frequent basis, and some of them are great, and some of them make me want to stick toothpicks in my eyeballs like they’re deviled eggs on a tray at a cocktail party. Sometimes people will post things like, “There are no bad events, there’s just the way we respond to them.” Oh. Really? There are no bad events? Can anyone be awake and say that, looking around the world today? There are plenty of heartbreaking, devastating events, and that’s true personally and globally. Pain is part of life, and to deny that is to live in a dreamworld full of unicorns and glitter, with an occasional leprechaun running through. Another really popular saying: “Everything happens for a reason.” I always cringe when I see that, because years ago, in another lifetime, I said that myself. Then I got older and saw some things and went through some things, and realized that’s an awful thing to say, even though I meant well when I said it. It’s an awful thing to say, because you never know who you’re saying it to, especially if you say it in a room full of students you don’t know personally, or you post it on social media to friends you don’t know. What if there’s a grieving parent in the room, or on your newsfeed? Do you think they’re going to take any kind of comfort in that idea, or do you think you might have inadvertently alienated them, leaving them to feel even more alone and angry than they already did? I’m not saying you can’t believe that, I’m saying it isn’t a compassionate thing to say. “Everything is perfect and unfolding exactly the way I need it to for my soul to evolve. This moment is offering me everything I need to know.” Get me the f&cking toothpicks. When we speak in these terms, we’re suggesting there’s a divine plan, and a certain path that’s been designed just for us, so that we can get the lessons we need, and maybe you believe that. Maybe you believe in karmic inheritance and reincarnation. I’d love to believe that. I’d love to believe we get more than one crack at this thing. I’d love to believe that some of the devastating things that have happened in my life have happened in order to balance out any of my past transgressions, and to help my soul evolve in this lifetime. I mean, reincarnation is such a comforting idea. We get to come back, and maybe we even get to travel with the same souls, we get to be with our loved ones again? That would make death a lot less scary, right? And I mean, we know energy doesn’t die, it just changes form, so who knows? We’re energy. And I believe in the continuation of consciousness, because that makes sense to me, and because I want to, but I don’t know for sure what happens after this, and neither does anyone else, and I’m not going to pretend differently. And because I don’t know for sure, I’m not going to say things with confidence that might not be true. What I do know for sure, is that we get to choose the lessons. We get to decide what we’re going to glean from our experiences, the wanted ones, and the unwanted ones. We get to decide if we’re going to pick ourselves up and start again. We get to do the work to grow beauty from our pain, or not. Anyway. Here’s the other problem with that line of thinking. If you believe everything is happening for a reason, you’re probably also going to treat the trials and challenges of your life as some kind of test. You’re going to ask yourself, “Why is this happening to me?” In other words, you’ll relinquish your own power. Sometimes we exaggerate our own importance, and sometimes we dishonor it. I mean, there are about 7 billion of us on this planet. Each of us unique. So right off the bat, we’re going to have 7 billion distinct experiences, but there’s universality, right? I mean, talk to people. We’re a lot more the same than we are different. We all dream. We all long for connection, love, touch, understanding, compassion, forgiveness and acceptance. We all have our heartbreaks, our unfulfilled wishes, nights when we’ve cried ourselves to sleep. We all feel alone in this gig from time to time, on the outside looking in, when really, we’re on the inside looking out. If you see a pattern in your life, if you keep making choices that lead to your heartbreak, I’d take a good, hard look at that. Then the question is not, “Why is this happening to me?”, but, “Why does this pattern keep showing up, why do I keep making these choices, and what is this pattern trying to reveal to me?” That way, you’re acknowledging your free will, and your own power. Things are not just happening to us. Life brings its everything, and we respond. We co-write this story. Sometimes people do crappy things because they’re young and selfish, or they don’t know themselves well, or they grow in a different direction, or they can’t face what they want so they make a mess. You don’t have to be on the receiving end of poor treatment, wondering where the lesson is for you. I mean, again, if it keeps happening, then yes, you have to ask yourself why you keep picking people who lack the tools to love you well, but we can all cross paths with a scorpion from time to time. The only lesson in that case is that people in pain, spread pain. That is all.